Does your RV need some repairs or remodeling? Contact Dar Fortney for any questions about RV Repair. In addition to automotive repairs, Collisiontec also specializes in RV repair services and are known as a quality RV repair shop. 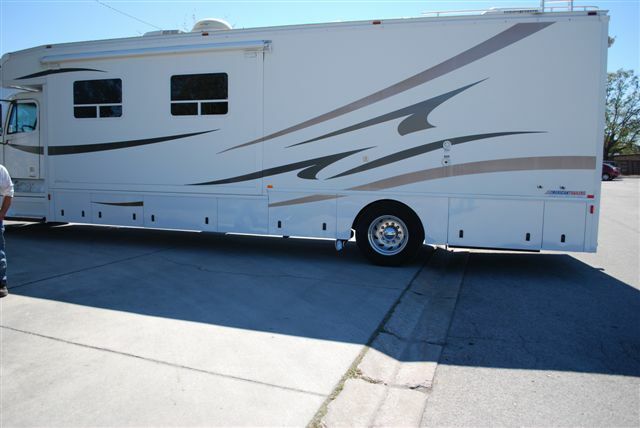 We have more than 20 years of experience and offer in-house RV services. Collisiontec repairs all makes and models from travel trailers, 5th wheels, class C, class A and buses. Some of our RV repair services include dents and scratches from minor to major, collision damage, water leaks, wall de-lamination, rust, windows and windshields, fiberglass and broken or damaged cargo doors, among many others. When we fix windows and windshields, we do not simply replace the glass but rather, we will go in and fix the root of the problem. If rust permits after the repair, your glass is likely to break again and we help to ensure that does not happen by actually fixing the rust problem. Collisiontec can manufacture cargo and baggage doors in-house, which will save you a lot of money by not having to go to the manufacturer of the RV. We can also make improvements to existing cargo doors that aren’t sealing or latching the way you had expected. Collisiontec’s RV repair service can custom match any paint or graphics work in-house. No RV repair paint job is too big or small for our team. Collisiontec offers custom graphics, repairing faded and cracking paint and graphics.